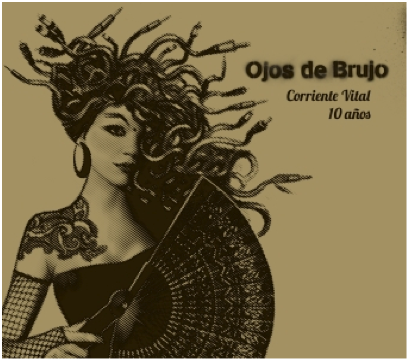 In 2000 they released their first album, “VENGUE”, but the idea for Ojos de Brujo had long been taking shape on the streets of Barcelona. Guitarist Ramón Jiménez had two passions – flamenco and hip hop, singer Marina Abad came from the theatre, and percussionist Xavi Turull already had experience in the music business as a member of Amalgama, a flamenco group in pursuit of new musical languages. At that time, Ojos de Brujo was a bunch of people moving back and forth between a flat in Escudellers Street (Barcelona) and parties on the beaches of Formentera. Musicians who combined metal and Tropicália, Hindu mysticism and electronica. ‘Mestizaje’ (or ‘fusion’) was not a label then; it was something born of hard work. The Rumba Catalana was the thread which bound it all together. Even after the release of “Vengue”, no two concerts were ever alike. Dani Carbonell and his group Macaco were just getting off the ground, which meant that he only appeared at the important concerts in Madrid and Barcelona. The songs never sounded the same, and each concert was like a new adventure – some ended with a battery of percussion, others with a heavy dose of house music. Then it was on to playing festivals, where Ojos de Brujo seized their opportunities. At many festivals people still remember: “They played here when nobody knew them; it’s here where they started getting big.” When you hear the same words repeated by half a dozen people hundreds of kilometres apart, you have the feeling they got big with a very small van. Next they decided to take charge and go it alone; to manage their own lives and musical career. On top of their musical workload comes the office work – they don’t want any bosses. “Bari” is released in 2002, selling 250,000 copies worldwide and picking up a BBC Music Award. They are now in and out of airports as much as the van. Decisions are taken collectively, everything is slower, self-produced and self-managed. “Techarí” is released in 2006. They’ve reinvested their resources and talent, along with collaborations, in a show which has got bigger and bigger. The family is growing; they cut back on the travel expenses a little. The music is still a trip; they are still connecting with musicians from all over the world. “Aocana” (2009) is their most recent musical outing, in which they lead the way in mixing one of the most delicate musical styles that exists – flamenco – with the main streams of electronic music. There have been seven world tours. They have played with musicians of all backgrounds and styles across five continents…and now, as they celebrate their tenth anniversary, they want to see their songs transformed by other ears… with more ‘Ojos’ (‘Eyes’) than ever.